*Looks like Michael Jackson’s former doctor may be charged in the singer’s death as early as Wednesday. 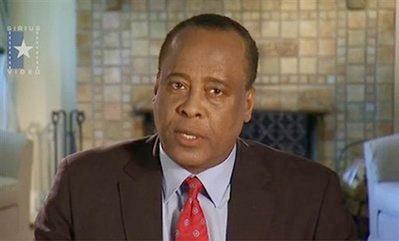 Dr. Conrad Murray, who practices in Houston, arrived in Los Angeles over the weekend in anticipation of a decision from the district attorney’s office, a spokeswoman said Tuesday, according to the AP. However, Murray’s criminal defense attorney, J. Michael Flanagan, tells People.com that his client could be officially charged on Wednesday. He would not confirm media reports that Murray would be charged with involuntary manslaughter. Jackson, who hired Murray to be his personal physician as he prepared for a series of comeback performances in London, died in Los Angeles after Murray administered the powerful anesthetic propofol and two other sedatives to help the chronic insomniac sleep, according to the Los Angeles County coroner’s office, which ruled the death a homicide.